The Premier League would be forced to invest an expected £400m into grassroots football under a Labour government, according to the party's election manifesto. Labour has pledged to "ensure the Premier League delivers on its promise to invest five percent of its domestic and international television rights income into funding the grassroots" and would legislate if required to ensure that happened. The Premier League currently invests £168m over three seasons into grassroots football and good causes but, with the sale of international TV rights expected to bring the next combined TV deal to over £8bn, a five percent share would equate to £400m of investment in the grassroots game over three years from 2016/17. "The last Labour government secured a commitment from the Premier League that five percent of all TV income should be invested in the grassroots," said Andy Burnham, shadow health secretary and keen football fan. "Since then, TV rights have soared by over 160 percent, but David Cameron has failed to make sure that the game's elite honours its obligations to the next generation coming through. "Football at grassroots is struggling and, in many cities, Premier League stadia loom over run-down changing rooms and overgrown pitches. The gap between top and bottom in our national sport has never been wider. "Premier League clubs only have permission to sell their rights collectively if they can demonstrate that it is in the wider public interest. That is why a Labour government will take action to ensure that every penny the Premier League owes is paid in full, unlocking an estimated £400 million for the grassroots in the next parliament." The Premier League argues that its commitment to the Football Task Force - setup by the Labour government in 1999 - to invest five percent of income in grassroots facilities and projects covered domestic TV rights only. 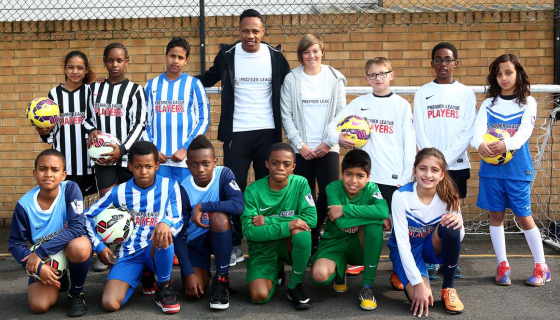 With the current domestic TV deal worth £3.1bn over three years, the league argues its commitment is more than met by the £56m a year it invests in grassroots football and 'good causes', including social inclusion schemes run by Premier League clubs in their local communities. Chief executive Richard Scudamore recently announced that the 20 Premier League clubs will redistribute more than £1bn outside of the league over the course of the next three year TV deal, although this includes parachute payments to relegated clubs and so-called 'solidarity payments' to lower leagues. A Premier League spokesman said: "The success of the Premier League benefits the development of the English game outside of the top flight. Significant investment has flowed through all levels of the game from the grassroots upwards, and well in excess of the five percent of domestic live broadcast revenues agreed in 2005. "Only last month Premier League clubs committed to investing at least £1bn outside of the league from 2016-2019. That will mean even more investment in grassroots football. "Currently we invest £56m per season in this important work and Premier League football will generate over £1.2bn in tax revenue for the Treasury this year alone." By raising the subject of their tax contribution to the Exchequer, the Premier League highlight the failure of successive governments to invest properly in the country's public sports facilities. Nevertheless, many in the game feel that the wealthiest football league in the world should do more to sustain the game's lower ranks and now the Labour Party have followed up last year's proposals for a grassroots levy by committing to the policy in their election manifesto. Whether they will find themselves in a position to be judged against their commitments remains to be seen, but if they do manage to form a government, many in the game will watch the situation develop with interest. Shadow sports minister Clive Efford has promised that Labour would "get tough" on the Premier League and would legislate to ensure they fulfilled their obligations. "We will get tough and under Labour's better plan we will make sure the Premier League lives up to its commitment to invest in the grassroots," said Efford. "This will have a profoundly positive impact on football and many other sports." The election pledge was welcomed by the Save Grassroots Football campaign, although founder Kenny Saunders hopes that the next government might also increase investment in sport themselves. "I'd like to think that if Labour do get elected they'll keep their promise and put some pressure on the Premier League and the FA to improve our game and invest more money into grassroots football," Saunders told Club Website. "£400m going into grassroots football would be a good start, but I'd say to all the political parties it's not just about football. It's about sport in general. It's about keeping kids off the streets, getting kids into teams instead of gangs, tackling the obesity crisis and so on. "By investing in sports facilities, you're going to help save money in the future. So hopefully the next government can stump up some more money themselves. "It's fantastic that grassroots football is getting some attention and it proves that working on this campaign for over two years is paying off. Andy Burnham sent me a tweet last week to say what a great campaign. That was really positive, but until I see the money comes in, I'll continue to fight to get more money back into grassroots football. "The game's in dire straits. I don't think people really understand the problems that are out there and how bad it is. This is our game. This is our future."